The Mayfair 4ft 6in Double Memory foam and orthopaedic Sprung Divan Bed comes with superb memory foam which allows you to sink slowly into the mattress, giving a restful nights sleep. This mattress is perfect for anyone seeking a firm mattress with the all the benefits of memory foam. 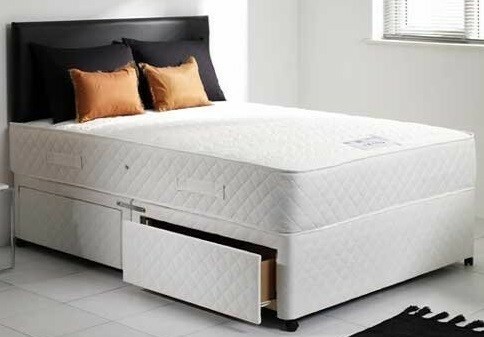 The Mattress is constructed around traditional 12.5 gauge spring units with ultra-supportive layers of 5cm high density visco elastic Memory foam to distribute pressure and to provide ultimate comfort and support. Layers of soft and high quality hypoallergenic fillings. The Mayfair bed is available with a Platform top Base for firmer support or a sprung edge base for a softer more luxurious feel. You can buy this divan bed with standard side drawers approx each 32" long drawer,Jumbo side drawers approx each 47.5" long drawer, Large full length side drawers, Continental drawers approx each 16" long drawer and slide storage options.